Farm Fresh Eggs from Hens Fed Organic Food! 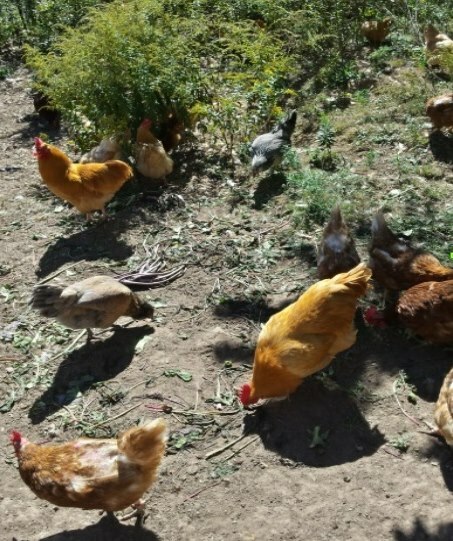 My girls are happy, healthy, and given free-range access to a HUGE outdoor pen. 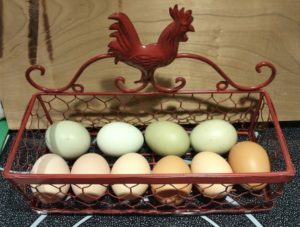 They are a mixture of breeds, laying Medium-Extra Large brown, tinted, white, blue, green, and even pink eggs, making every dozen fun and colorful. These eggs are beautiful and healthy for you, with rich, orange yolks due to their diversified diet. 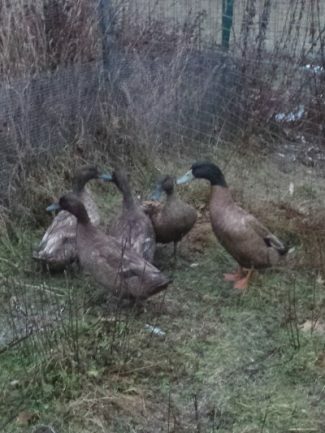 They eat scraps from my garden in addition to their feed, and whatever they forage for themselves, making their eggs far superior to any you will find in the store. All money from sales goes directly back into my birds. Please support your local farms! Eggs are $4.00 a dozen. I am also selling off some of my 2 year old birds, to make room for more breeding stock. This spring, I am planning on selling Buff Orpington chicks, day-old straight-run (not sexed), and 8 week old started pullets (females), please scroll down for more information. They waddle, they quack, and they lay lots of eggs! 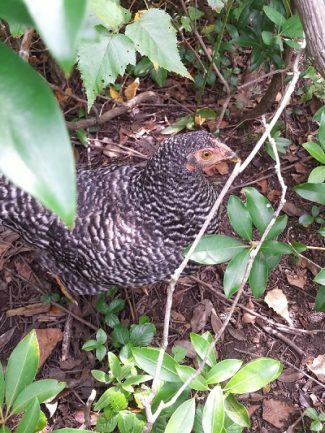 My meat chickens are happy, healthy, and pastured around our large organic garden. To allow our birds to have a more natural life, we use Red Rangers, an alternative to the Cornish Cross breed typically raised in large-scale industries. 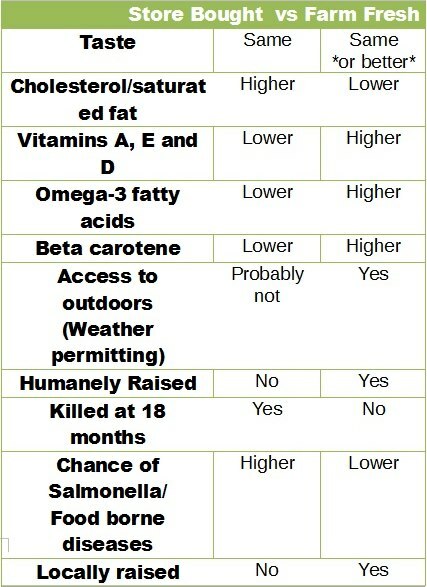 While growing slower than other meat bird breeds, this allows them to live a more natural lifespan, all the while foraging, jumping, and running around like chickens should. With smaller breasts and larger legs, these guys are able to be free-ranged from the moment they no longer require heat lamps—2-4 weeks old depending on weather—and have fun running, jumping, and scratching around as all chickens should. You can expect the birds to weigh 4-7 lbs. (processed) and have flavorful, nutritious meat. 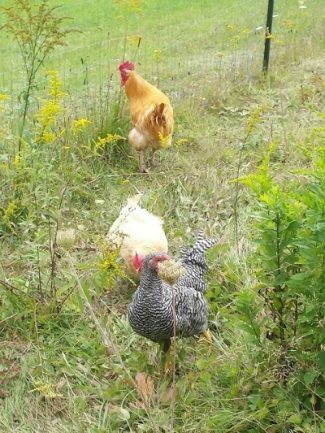 They eat scraps from the garden in addition to their organic feed, and whatever they forage for themselves, making the meat quality far superior to anything you will find in the store. Processed birds are $15. Raising meat birds naturally and organically is a lot of hard work, and requires expensive equipment, as well as hundreds of pounds of chicken food. All money from sales goes directly back into my birds. Please support your local farms! If you are interested in eggs, scroll up! Each year we typically have extra birds, from unexpected hatches to overstocking the previous year. If you are interested in starting your own flock for your very own home grown eggs, we have plenty of options for you! 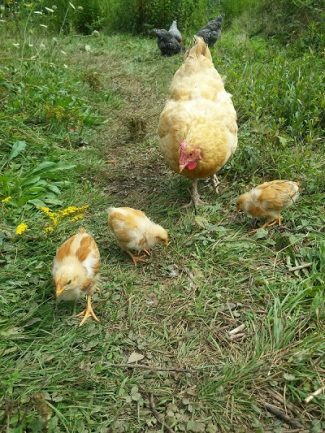 Fully grown laying hens are an excellent option for those who are new to raising poultry, or want eggs immediately! In order to keep up production, we order new chicks every year. Because we do not slaughter our birds after 18 months like many factories, our flock begins to grow too large. To prevent this, we sell off our two-year-old hens to people looking to start their own flock. While no longer in the prime of their laying, these are true-tested birds who will continue to provide you with a steady supply of eggs for several years, all without the hassle of young birds or chicks. 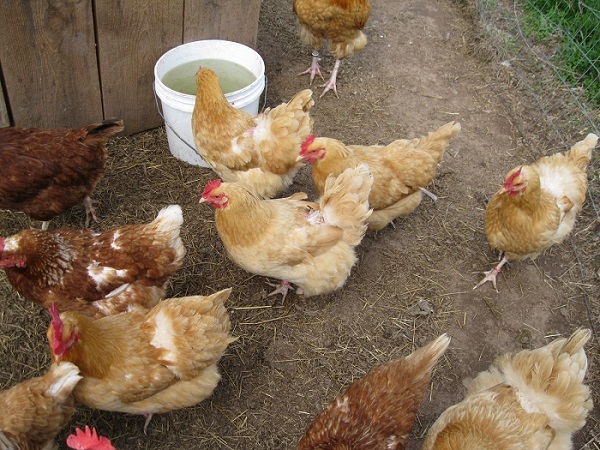 Hens are available in limited supply year-round for only $10 each! Unless pre-ordered in the spring, pullets are only available on a first-come-first-serve basis from late summer through fall for $20 each. 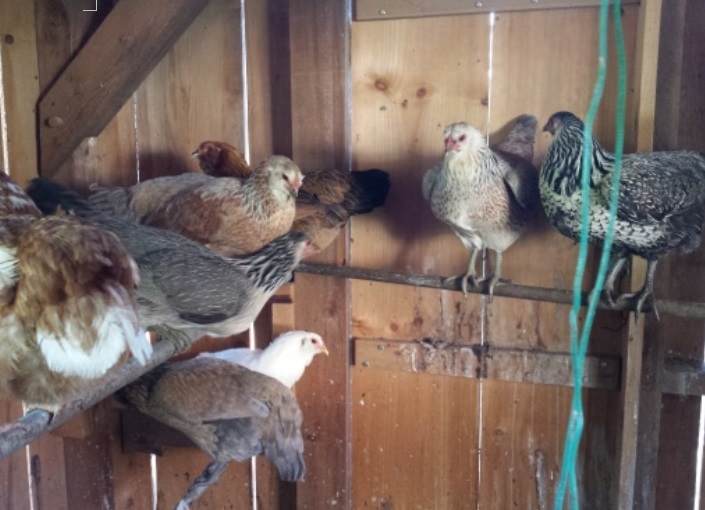 Breeds range from Buff Orpingtons and to Easter Eggers, to Dominiques, Barred Rocks, and Barnyard Mixes. Each group is sure to be colorful, fun, and productive! Under one month old, chicks are best for those who are prepared for extra responsibility. Buying chicks is one of the most inexpensive methods of obtaining poultry, but requires the most personal effort. Chicks require specialized food, housing, and heat their first two months of life. However, the effort is well worth it as you will be able to develop a relationship with your flock from the very beginning! We only offer our chicks unsexed (approximately half males, half females) as it is too young to determine gender. Chicks are $2 each, and are available late spring through fall. Due to the unpredictable nature of when (and if) my hens want to raise a clutch of eggs, chicks cannot be pre-ordered, but if you have a specific request in the spring, we will try our hardest to satisfy it.